Ben Mirin performs at the Sapsucker Woods Migration Celebration festival last September. Photo by Shayna Muller. Ben Mirin is not your average naturalist, or mix master. As a wildlife DJ, Mirin blends his passions for animal sounds and beatboxing to create music that showcases the voices of the wild and teaches people about nature. Mirin, who is also a National Geographic Explorer and natural sounds recordist for the Cornell Lab of Ornithology, embarks on expeditions across the globe to gather sound recordings of wildlife for his music and science. The Cornell Lab recently named Mirin an Environmental Ambassador. We asked him how he uses hip hop and bird song to strike up new dialogues about the natural world. Ben Mirin: Beatboxing is a musical style based entirely on vocalization. You use your voice to create different sounds and blend them together in a musical way. What’s exciting is that beatboxing is universal. Everyone has the instrument: your mouth. And if you’re listening carefully, you can integrate the sounds around you into your musical vocabulary. When were you inspired to mix beatboxing with bird song? BM: I’ve been birding since I was about 4 years old, and beatboxing since I was 9. When I moved to Brooklyn, I had a hard time hearing the bird song over the traffic, and I very quickly realized that I was cut off from a critical part of myself. But I felt more at home when I was able to share my passion for the natural world with the beatboxing world. I started performing little songs around New York City where I would imitate bird songs while beatboxing on stage, and using the music to teach people about how to tune into their backyards. 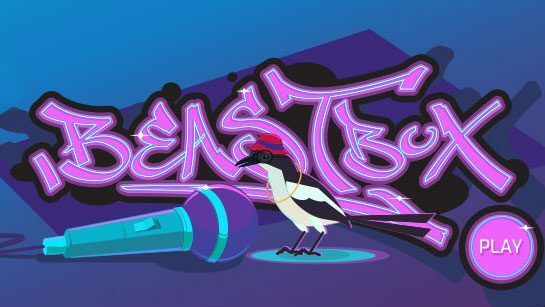 BeastBox is a new free online game that takes sound clips from real wild animals and transforms them into musical loops, allowing users to mix and match them into an endless variety of beats, breaks, and drops. Along the way, players learn about animals, ecosystems, and acoustic environments. 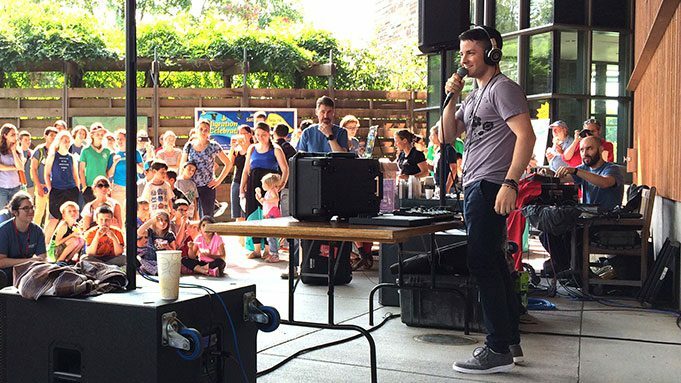 The game is the result of a collaboration between the Cornell Lab of Ornithology’s Macaulay Library, the Cornell University Hip Hop Collection, and wild sounds DJ Ben Mirin. What makes music such a strong storyteller? BM: Sound has opened my eyes, and my ears, to stories that I might not otherwise think about. I go on expeditions to record wildlife sounds that are important to a particular story. 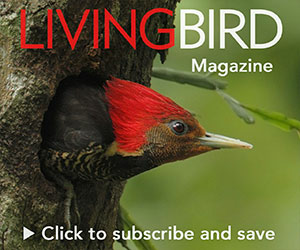 In India, it was about recording birds that were locally common but critically endangered. No one knew how rare they were. It was about making music with the birds’ voices, playing it to a local audience, and getting them excited about their natural heritage. What does it take to get, and keep, young people excited about conservation? BM: The whole point is to get people excited. My hope is to equate learning about nature with the joy that it brings. And I want to share that; I want everyone to discover the inherent reward in connecting to nature. Where have you seen that happening, through sound? BM: I lead bird walks here in New York City. One of my favorite experiences was taking a smaller group of kids into Central Park and just listening. The way that they tune into the world around them is inspiring. When one kid turned to me and said, “I feel like I’m in the jungle!”, I was just overjoyed, because that is their jungle. You have to find the jungle at home before you can find the jungle abroad. Do you have any advice for someone who wants to start tuning into their own jungle? BM: Stand silently in your own backyard and count all the things that you can hear. It can be anything, even a jet plane. Though hopefully not. Just keeping that tally of what you can hear will make you more aware of the orchestra playing all around you. The beautiful part is that you feel like you’re somewhere else, but you’re right at home. It transforms your perception of your world.